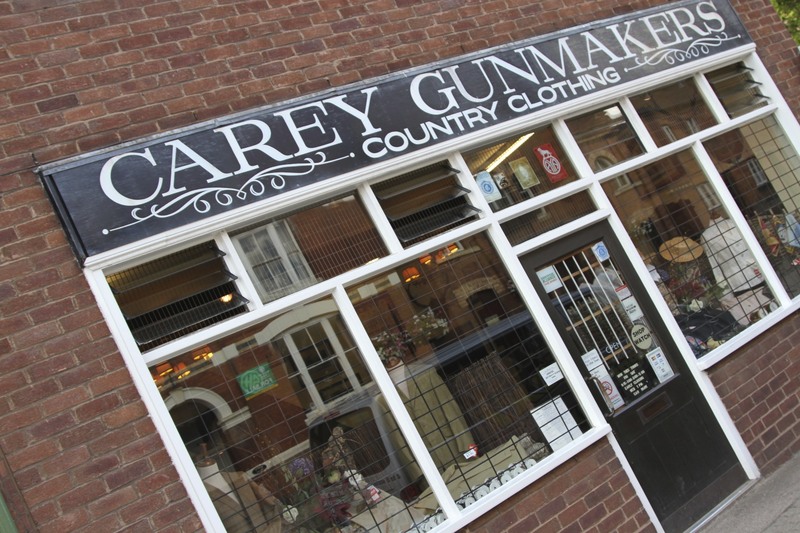 ‘Quaint verging on twee’, instantly springs to mind when wandering around Ledbury. Its probably not fair to pigeon-hole a town of 10,000 people that way, but it seems appropriate. 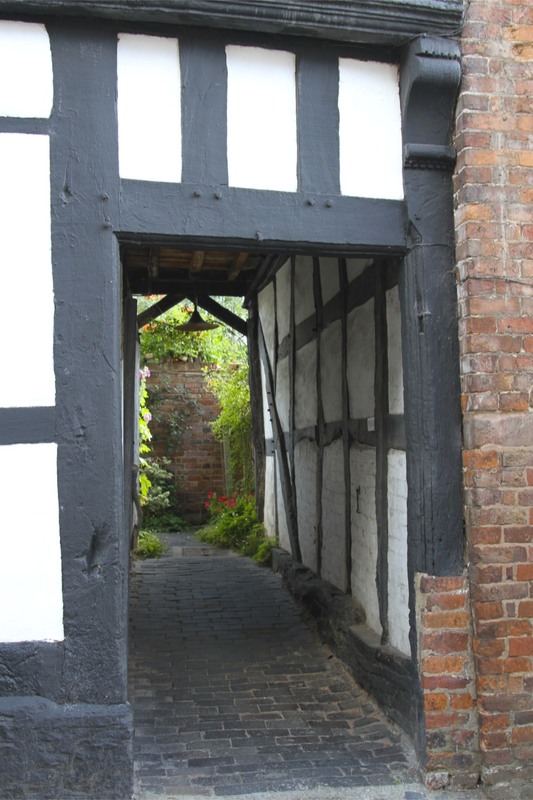 After all, it was here that a man from New York informed me I was standing in the most photographed alleyway in England. What he really meant to say, but was too polite to do so, was that I was standing in the middle of his photo of the most photographed alleyway in England. I removed myself immediately. 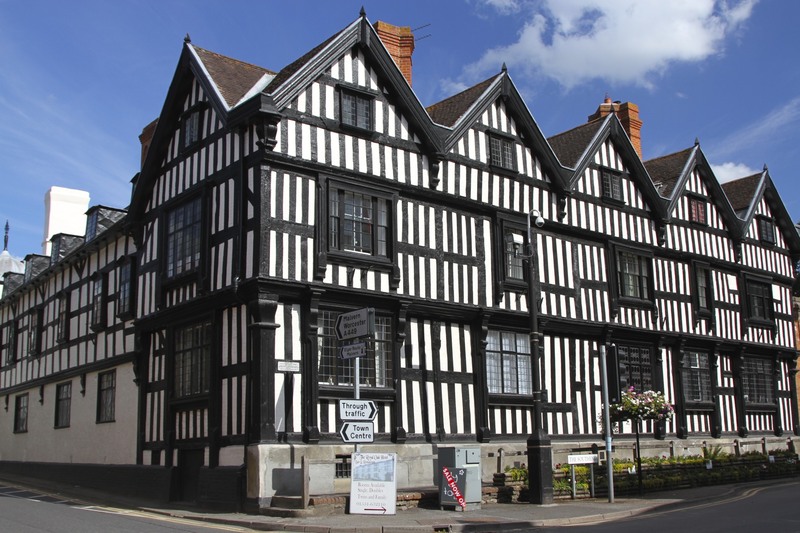 Ledbury feels ‘twee’ because it has managed to preserve a magnificent collection of historic buildings – something to be applauded. 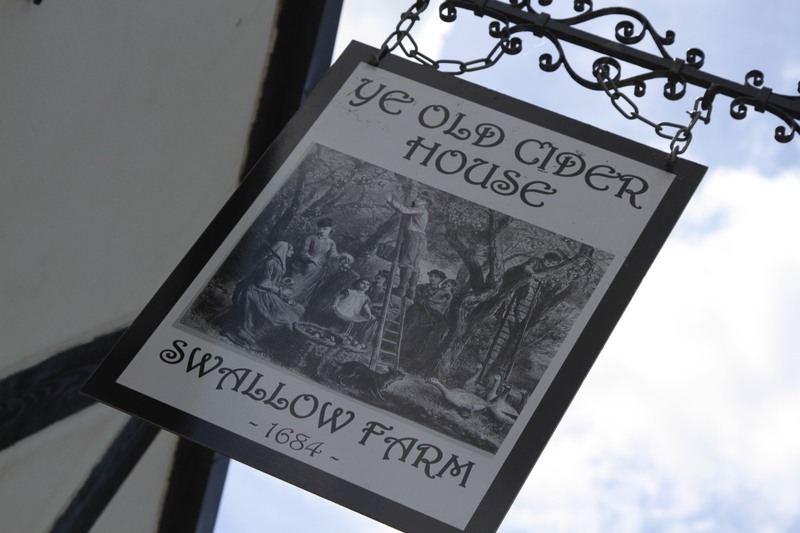 It feels like you’ve been transported back in time, with lots of other tourists along for the ride. 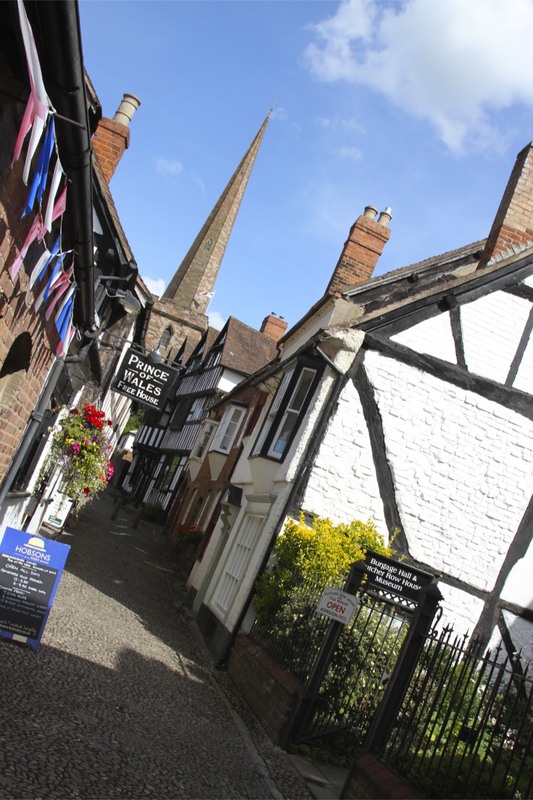 Whether it is the glorious 12th century St. Michael and All Angels Church or the 17th century timber-framed Market House, Ledbury is a town with a rich history writ large. 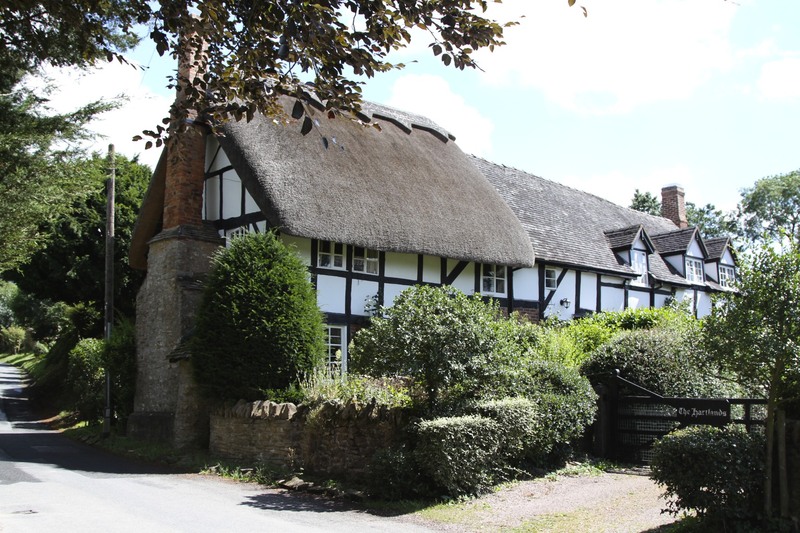 I don’t think I’ve seen a bigger collection of timber-framed houses anywhere in England. Chester, perhaps? 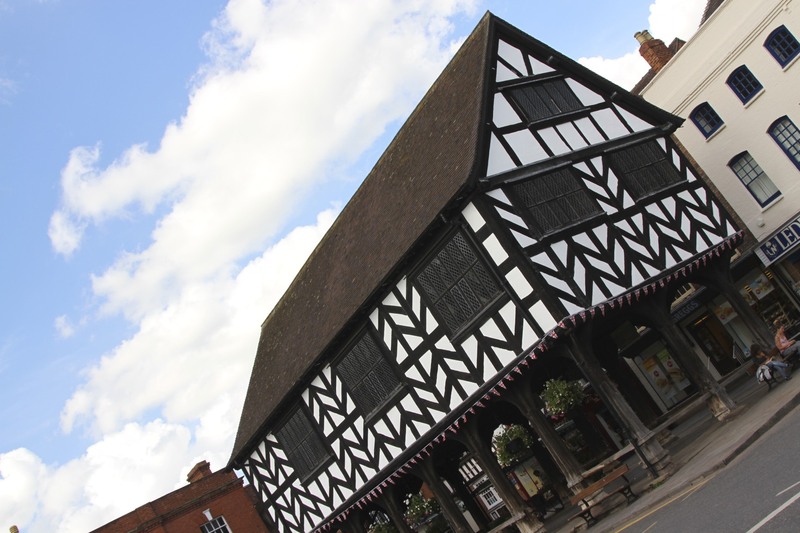 Ledbury’s origins are Saxon – part of the Saxon Kingdom of Mercia, but ruled as a fiefdom by a Saxon knight, Edwin of Magonsaete. 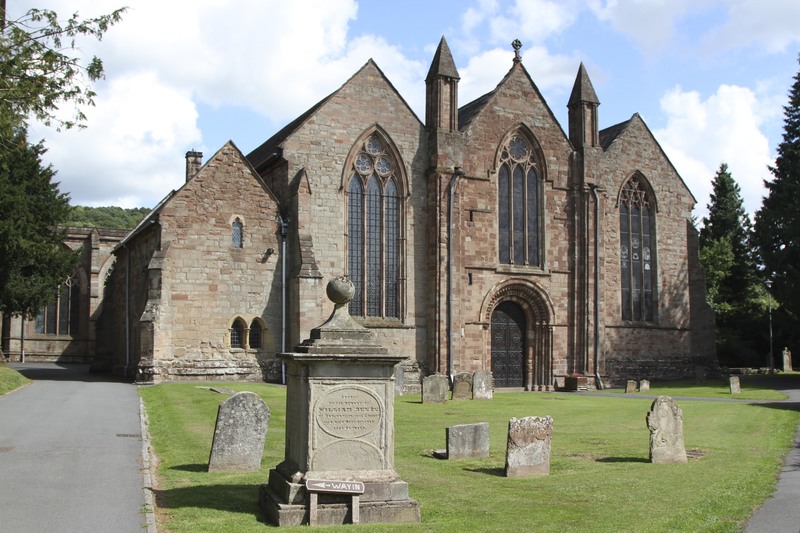 On his deathbed he bequeathed Ledbury to the church. 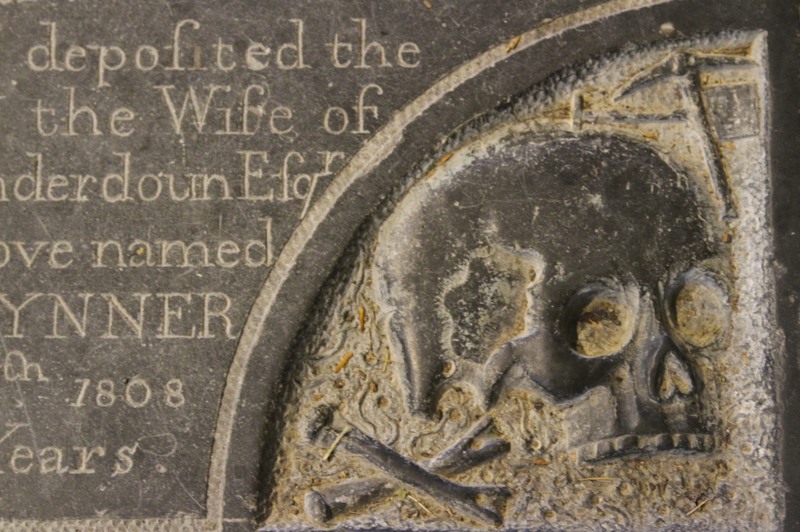 A new convert to Christianity, Edwin left his estate to the church so that they would intercede, through prayer, on his behalf to ensure he reached heaven. Nice work if you can get it. Although Christianity had come to the British Isles with the Romans, it was never more than a minority cult amongst numerous Pagan beliefs. 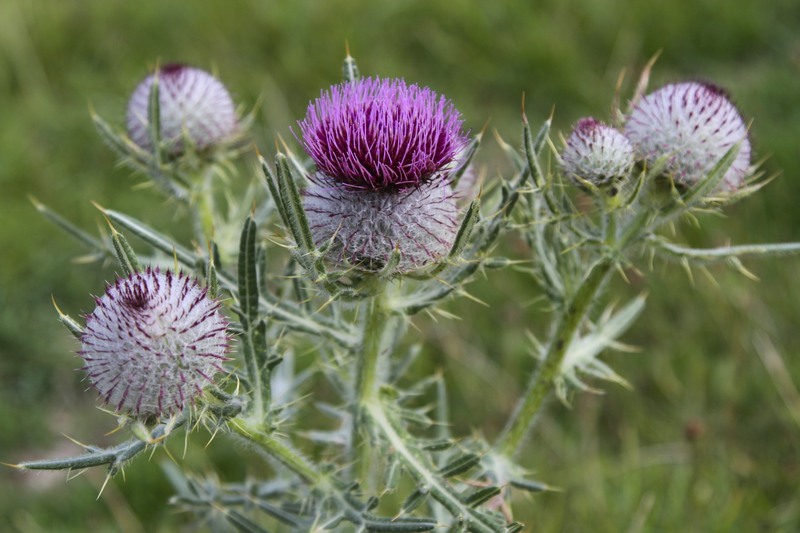 It truly arrived in England riding on the coat-tails of St. Augustine in the 6th century. 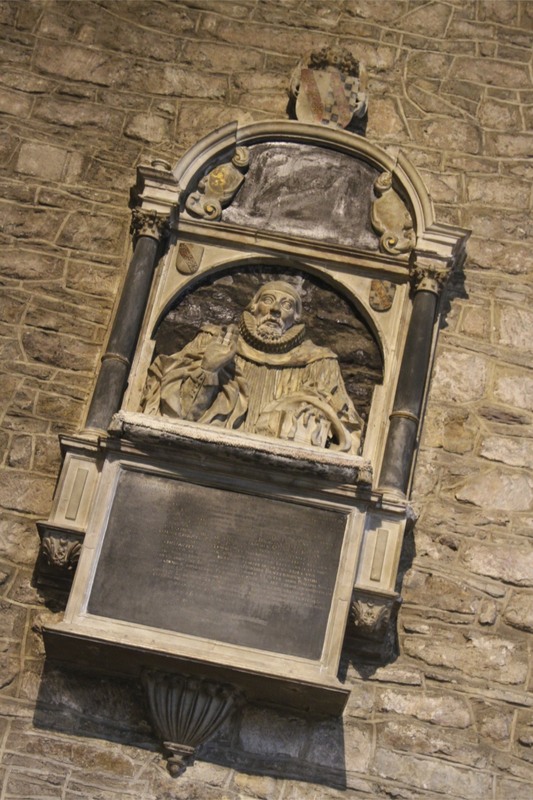 This new and fashionable religion, with its emphasis on centralised authority and intolerance for Pagan beliefs, secured the patronage of King Aethelbert. 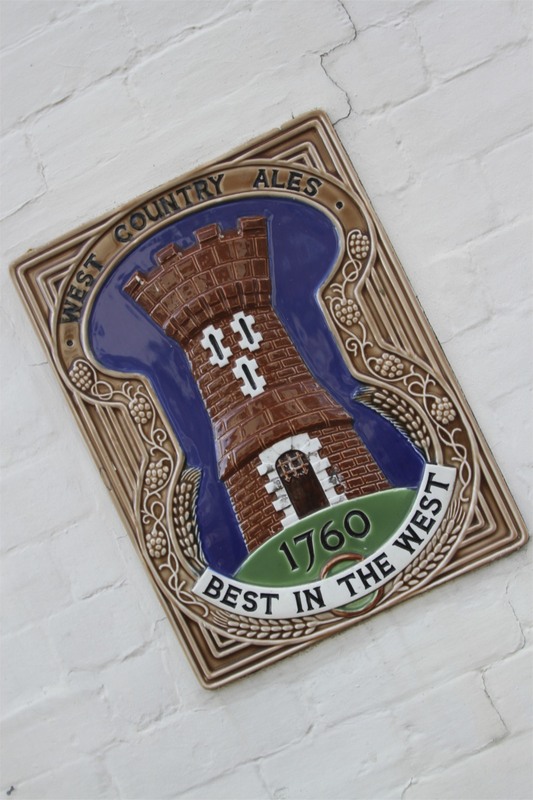 When the Diocese of Hereford was founded in AD 676, Christianity was well on its way to being a ‘national religion’, thanks in large part to the sponsorship of the ruling classes. 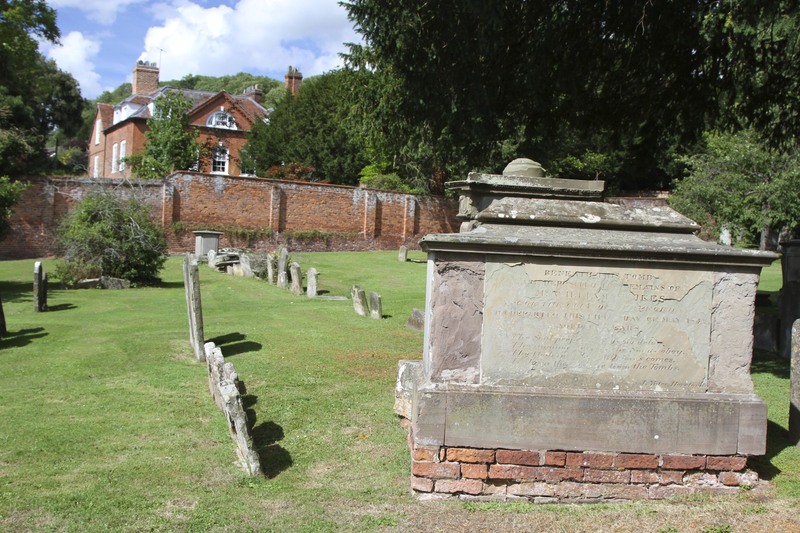 Once under the control of the church, Ledbury developed into a major ecclesiastical centre – its mentioned in the Doomsday Book as a rural manor owned by the Bishop of Hereford. 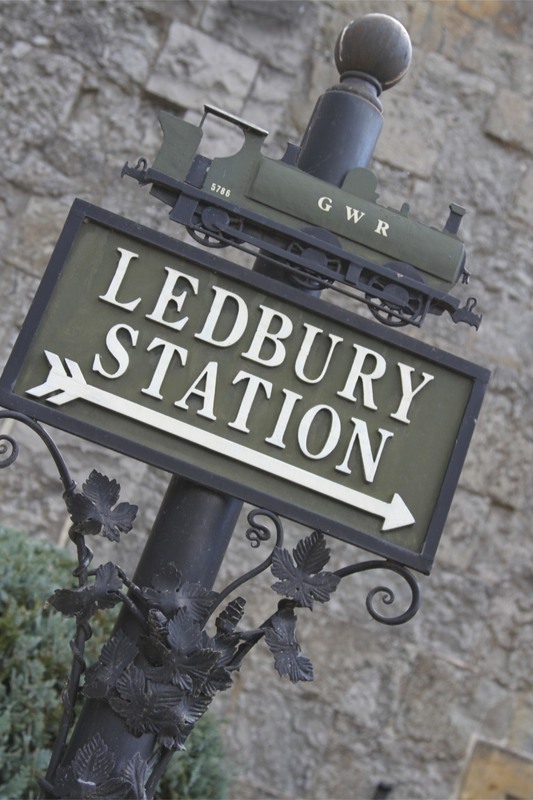 It was the Bishop who established the town of Ledbury, and his layout for the town remained largely unchanged until the Victorian-era, when the arrival of the canal and railway led to significant growth. 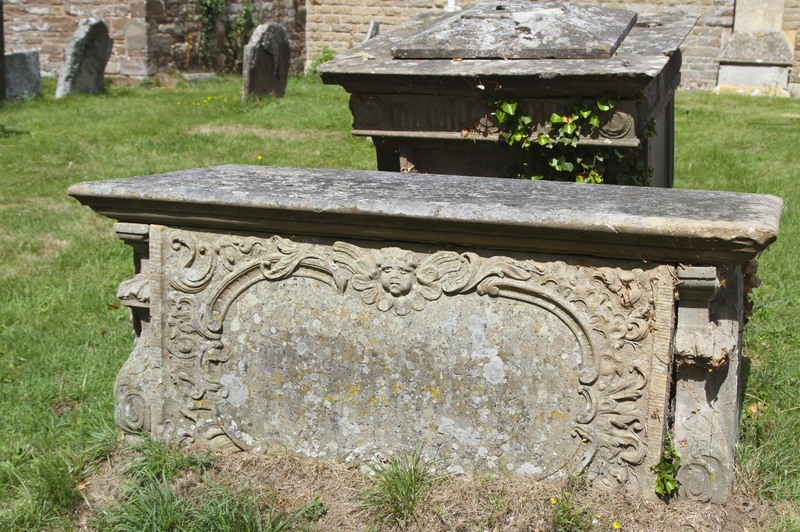 The outstanding ecclesiastical feature remaining from that time is St. Michael and All Angels Church. Its a massive church for the size of the town, and dates from AD1140, although it has been added to throughout the centuries. 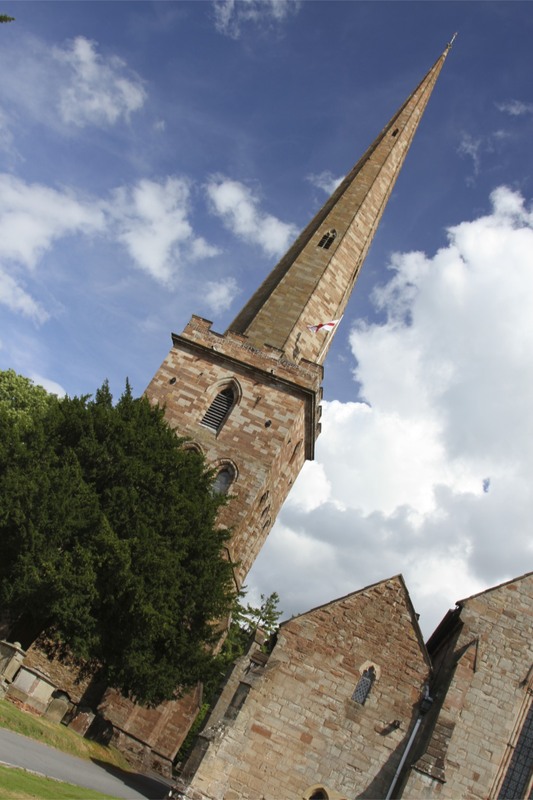 The oddity about the church is that the tower, with a spire added in the 18th century, is separate from the church. No one seems to know why. The interior of St. Michael and All Angels is wonderful. 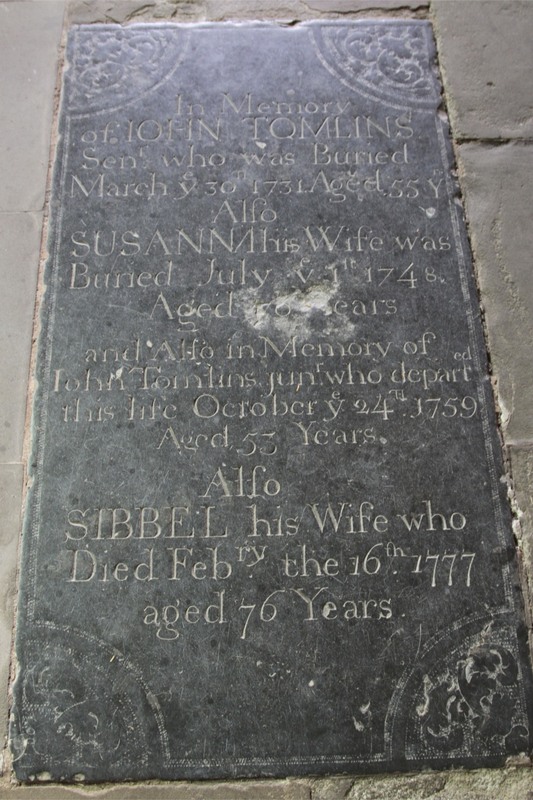 Full of tombs underneath the floor, and ancient memorials on the walls. 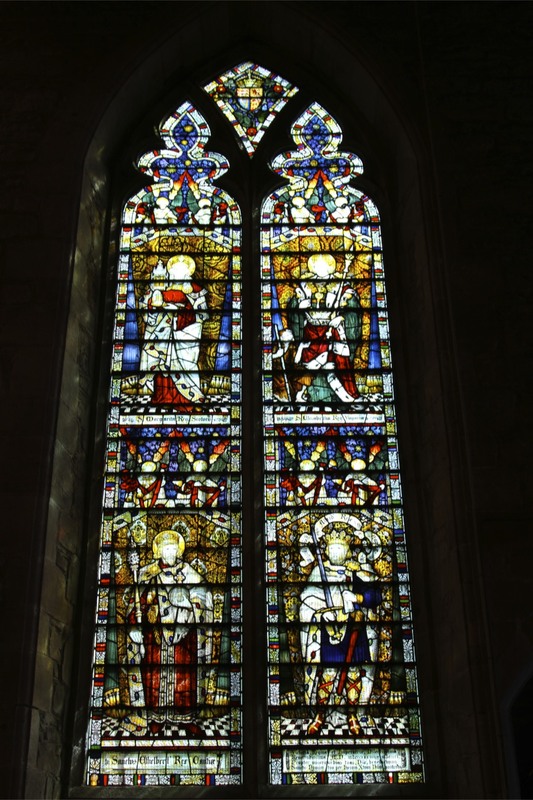 It also has some beautiful stained glass windows dating from different periods, some Medieval. 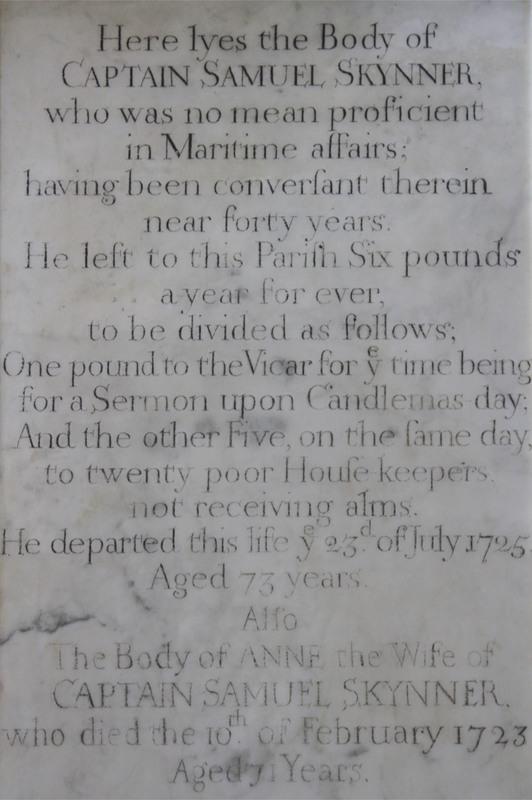 One lovely memorial is to Captain Samuel Skynner, who, in 1725, bequeathed six pounds (£6) to be divided between the vicar and twenty poor housekeepers who weren’t receiving alms (poor relief). 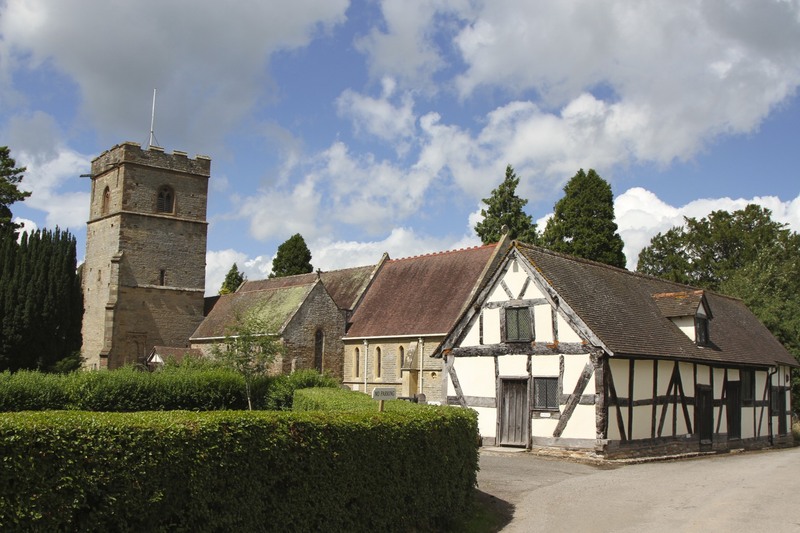 After the Reformation and Dissolution of the Monasteries, Ledbury fell under the control of several powerful families. 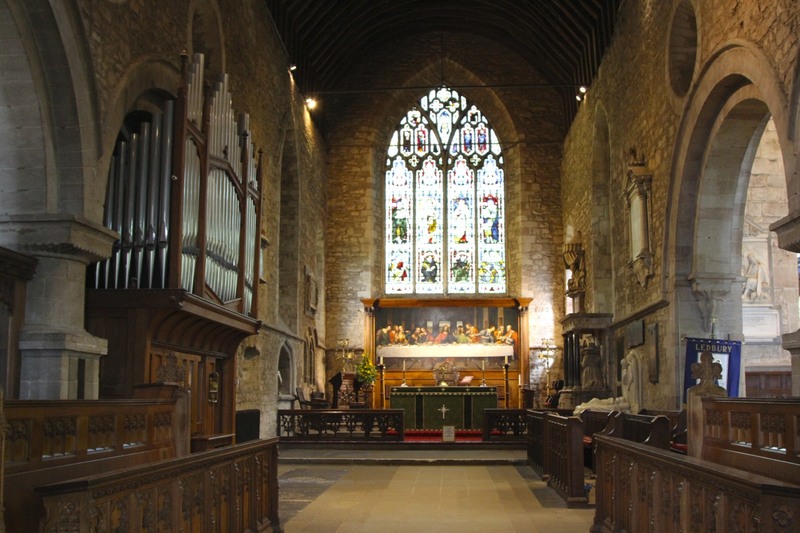 Church buildings were converted to secular use and many have, remarkably, survived into the 21st century. 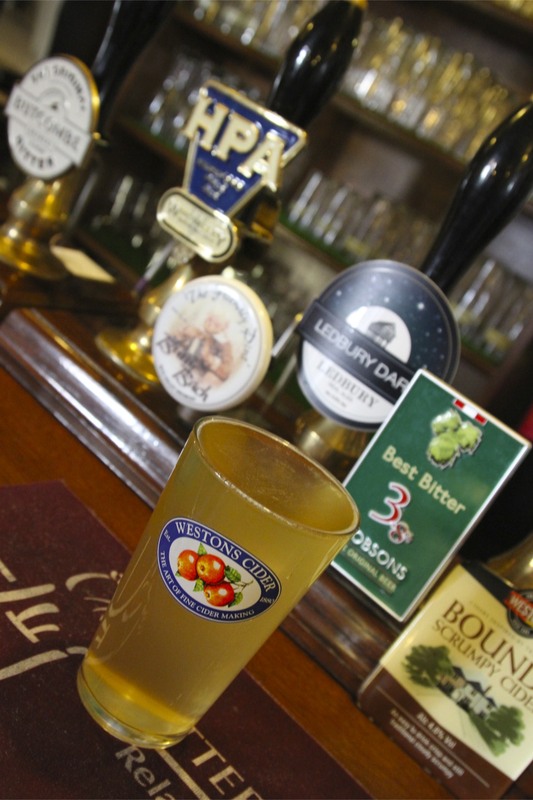 It is a pleasant place to spend a few hours pottering around, occasionally cooling down with a glass of local cider – they love their apple-based beverages in this part of the world. 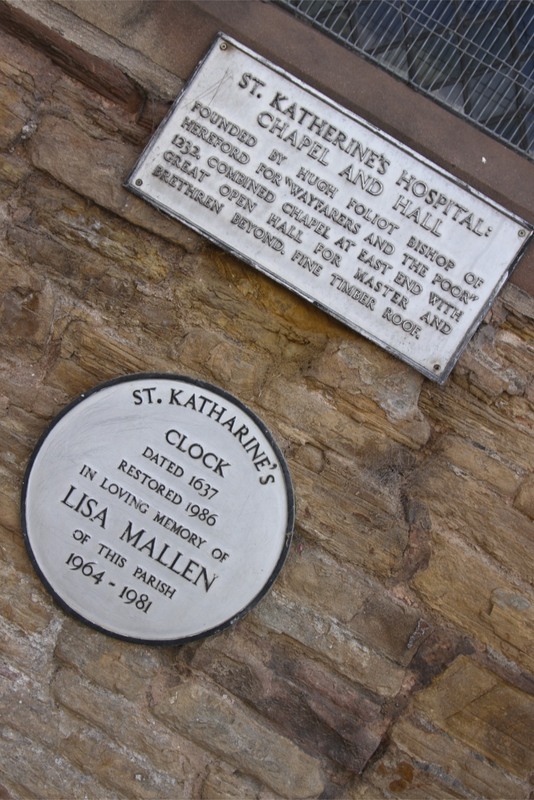 Sadly, St. Catherine’s Hospital, which dates from 1232 and is one of the few surviving hospitals from this period, wasn’t open when I was there. Its currently being restored and repaired, and will presumably reopen to the world sometime soon. Wish I’d been able to go inside, all the same. 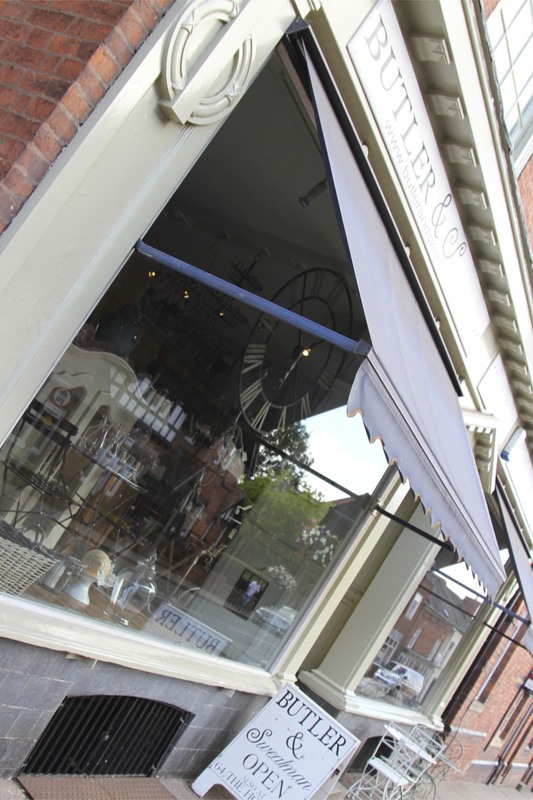 For all its history, time has not left Ledbury behind. It is now home to lovebirds Elizabeth Hurley (she of the dress) and Shane Warne (he of the wicked spin and even wickeder text message). 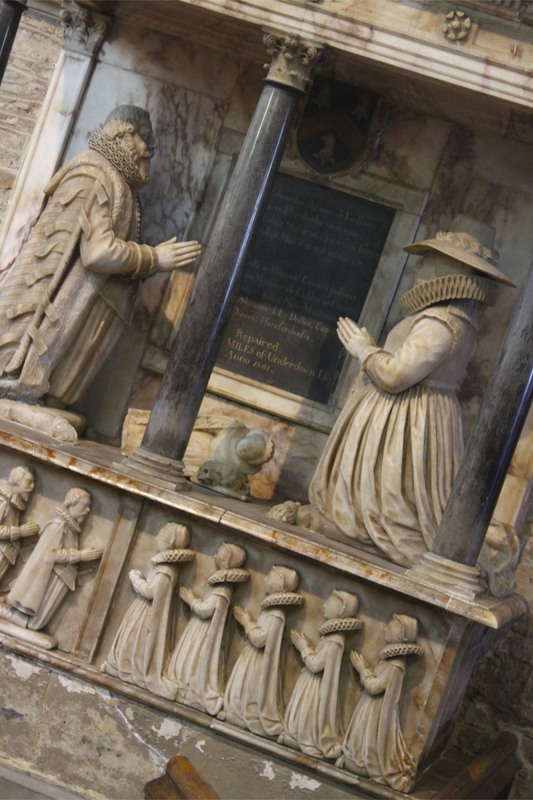 Rubbing shoulders with scandalous celebrity probably makes Ledbury less twee, and possibly a little more glamourous. 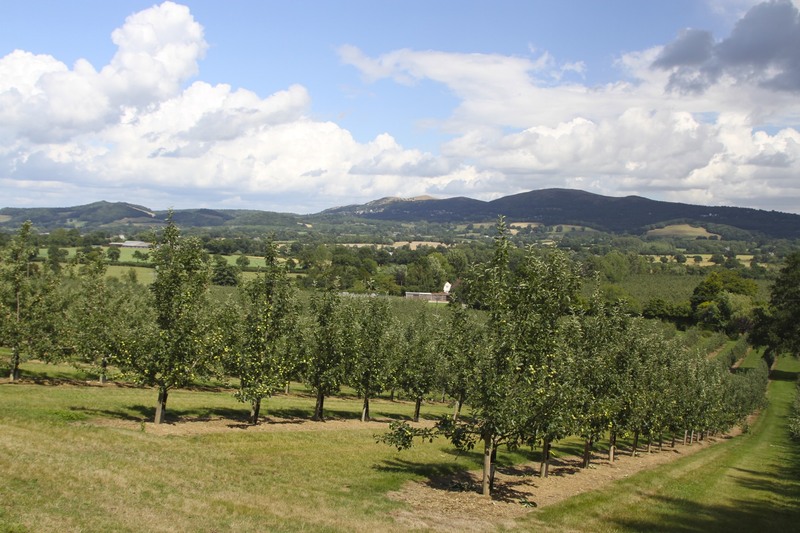 Herefordshire is one of those English counties that doesn’t receive the recognition it deserves. 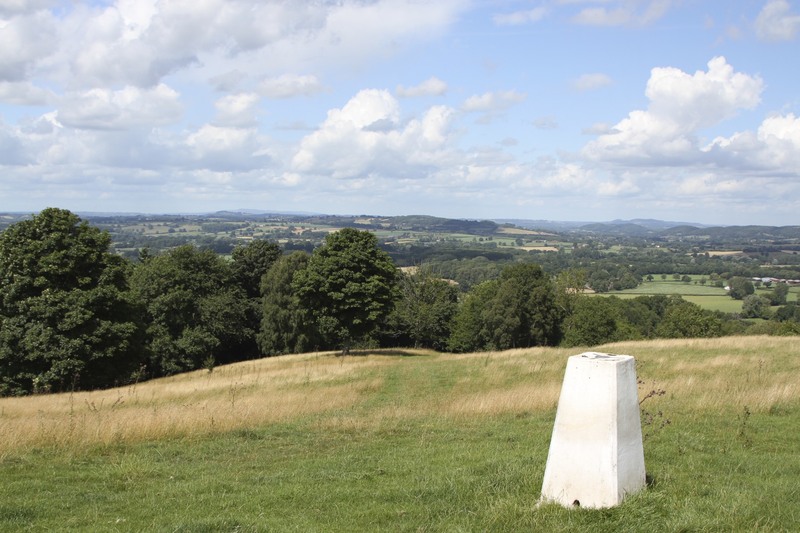 It is stacked full of historic towns and villages, some dating from the 6th or 7th century; it has beautiful rolling countryside; and its location on the border between England and Wales meant it was strategically important for several centuries of conflict between Anglo-Saxons/Normans and Celtic Welsh principalities. 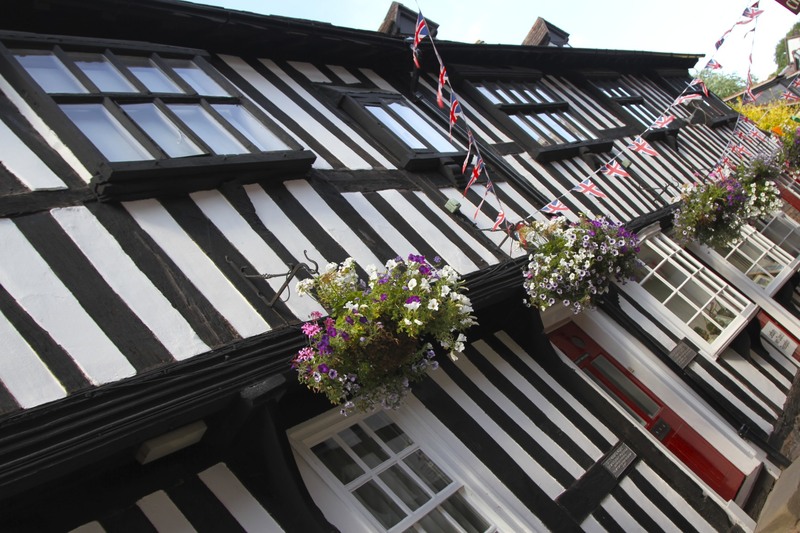 With its modern history firmly embedded in the aftermath of the Norman Conquest of 1066, it has a legacy of language, culture and architecture that befits an area of the Welsh Marches. The Marches were the western frontier for the conquering Normans, ruled by independent Marcher Lords through military power with barely any control exerted on them by the King. 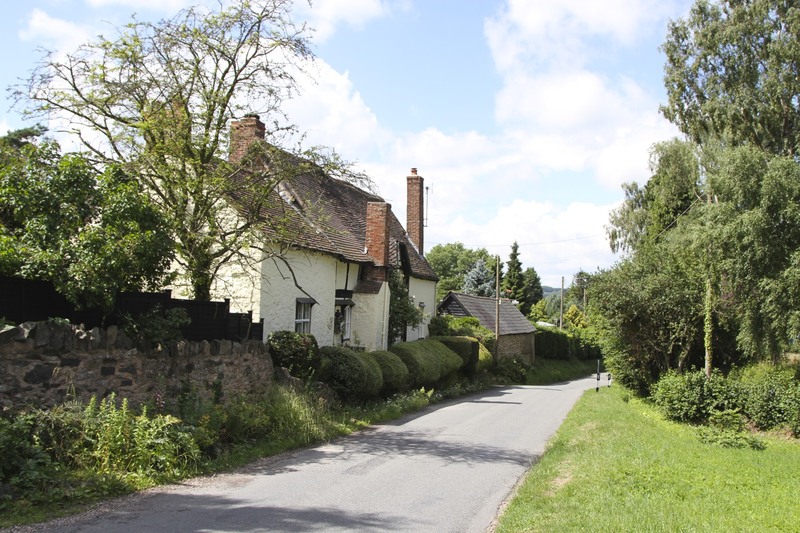 Walking through the countryside between the Malvern Hills and Ledbury makes for a wonderful journey, and takes you out of Worcestershire and into Herefordshire. 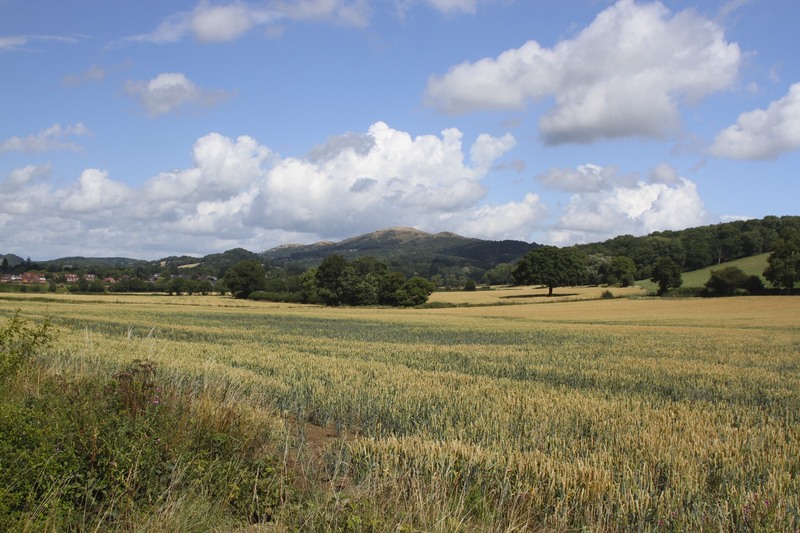 The views over the rich, agricultural countryside are magnificent, often with the Malvern Hills as a backdrop. You pass through picturesque villages with ancient buildings and beautiful churches, only to find yourself face-to-face with semi-fortified country houses in the middle of nowhere. 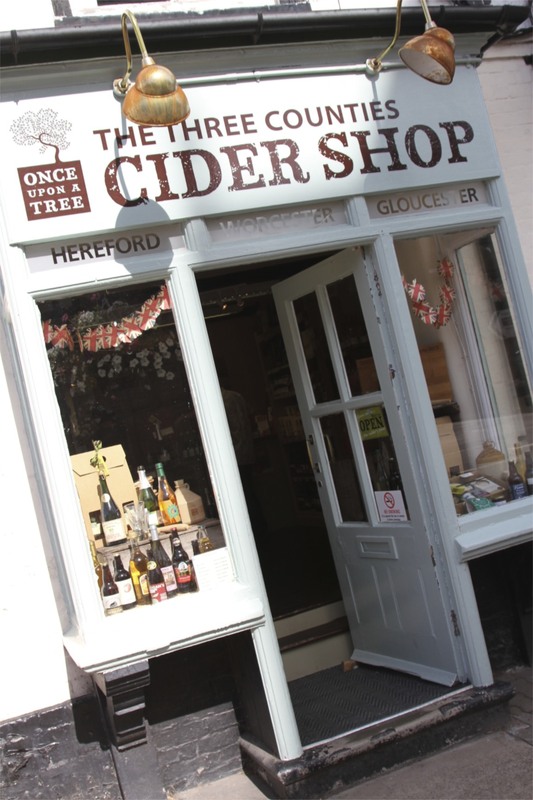 It is a predominately agricultural county and, while it may be famous for its Hereford cattle, it is also the centre of an ancient and renowned cider making industry. The latter, far more interesting to someone who has been walking for several hours under a hot sun. 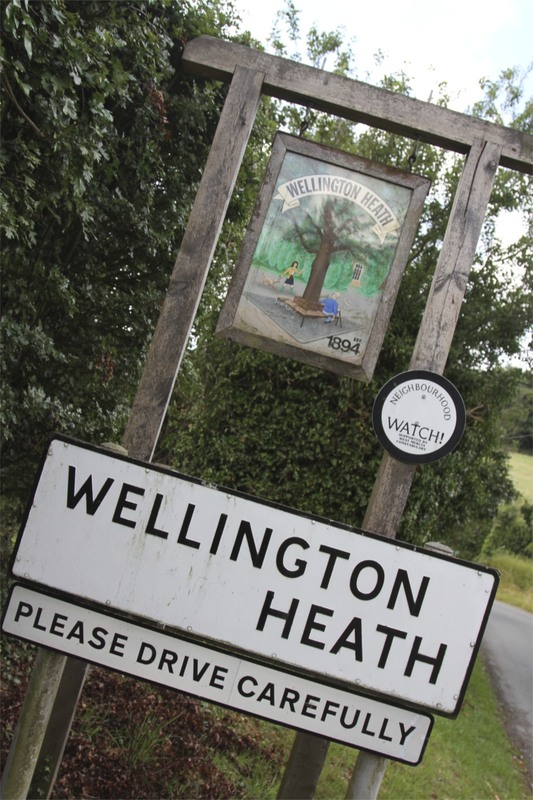 I headed over the Malvern Hills to the village of Evendine, before cutting across country towards Colwall (home of another spring dispensing Malvern Water). 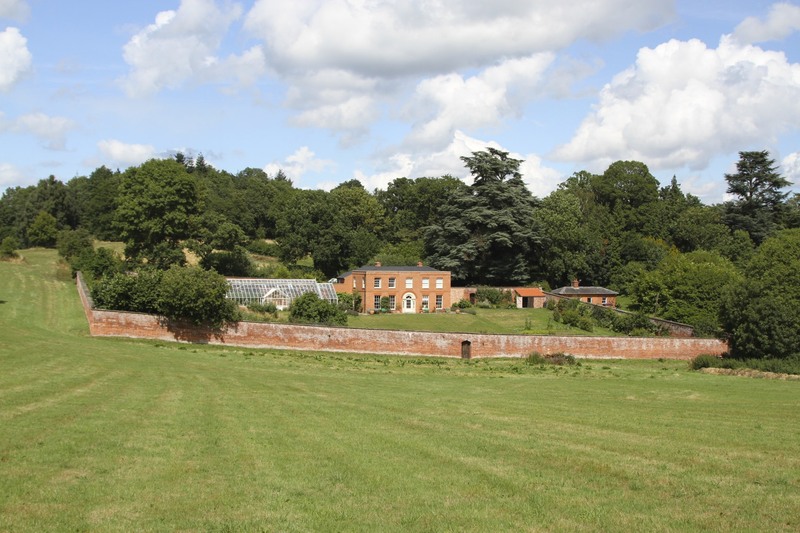 It was in the countryside between the two that I came across Brockbury Hall: the majority of this historic house dates from the 18th century, but parts of it are 17th century. It even has the remains of a former moat. The Hall has been in the same family since the 16th century, much of the family money in the 18th century seems to have come from the West Indies – sugar, rum, slaves? 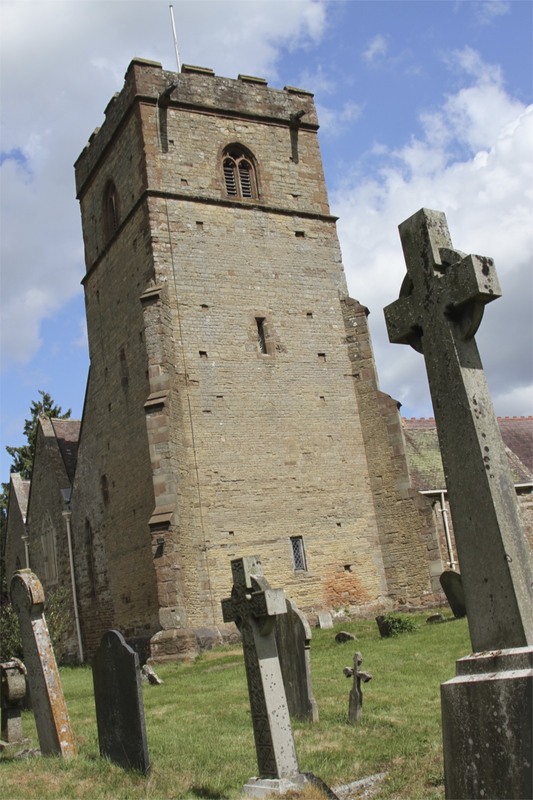 A short walk from Brockbury Hall is the small hamlet of Colwall, which has a lovely Norman church – none of your towering spires for the Normans, just solid squares. I couldn’t go inside as there was a wedding, but it is a picturesque place. 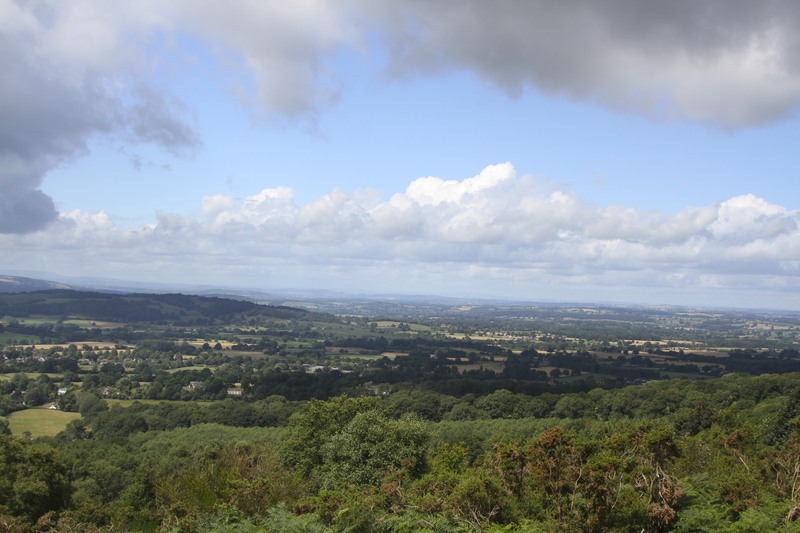 I was heading to Oyster Hill (no idea why its called Oyster, its miles from the sea), from which there are magnificent views all the way to the Black Mountains in Wales. 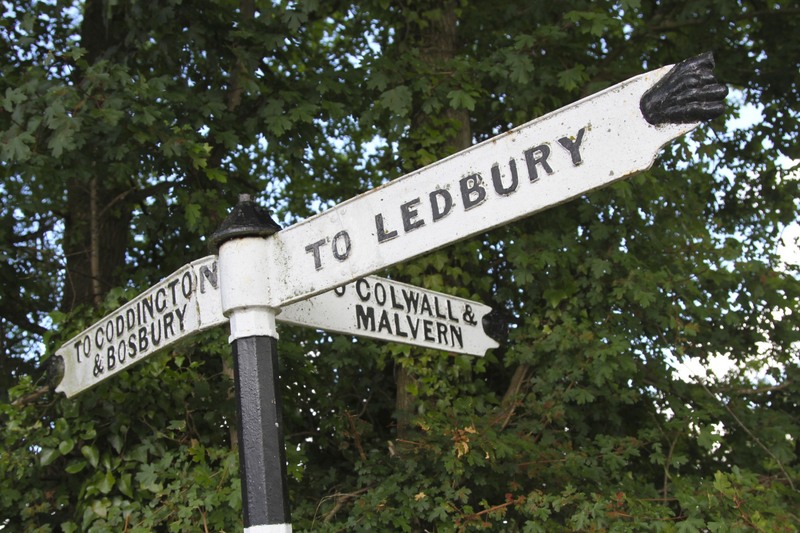 Here you can join the Herefordshire Way, a trail that takes you into the historic town of Ledbury, my final destination. The surprises hadn’t ended though. 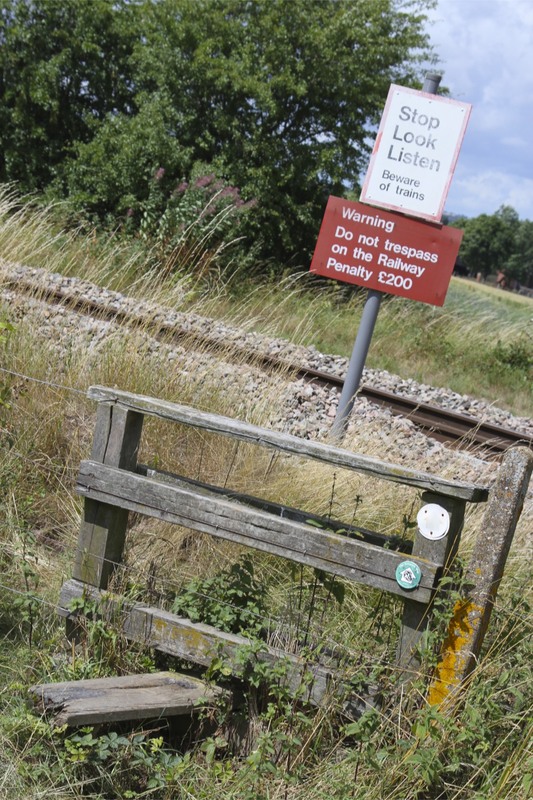 As I walked south towards Ledbury I found myself crossing park land. Before I could look at the map, a magnificent walled house emerged out of the trees: Hope End. I didn’t know, but this is where Elizabeth Barrett Browning, one of the most famous poets of the nineteenth century, lived. 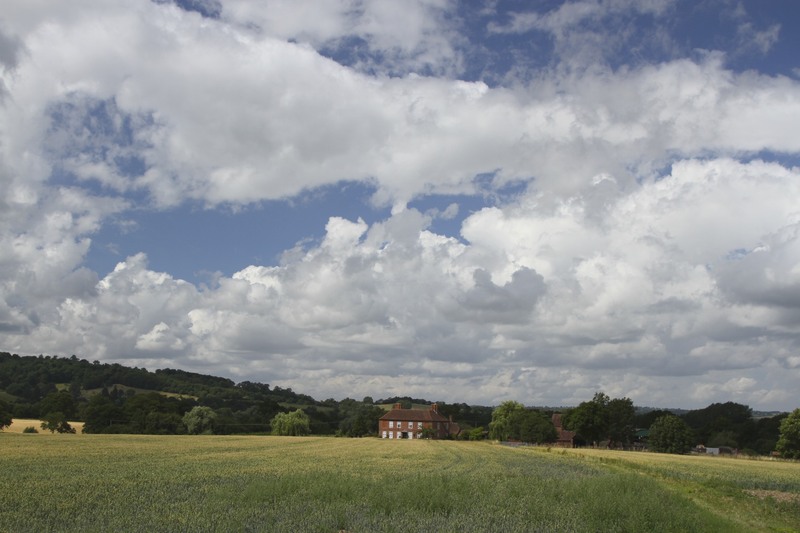 The beautiful countryside around this area inspired some of her most famous work, including the epic blank verse Aurora Leigh, part of which is set in Malvern. She was married to Robert Browning, no slouch himself when it came to poetry.